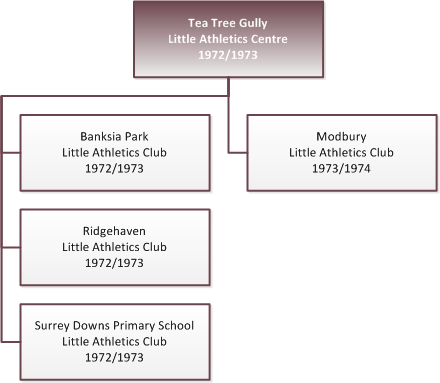 The origin of the TTGAC was the formation of the Surrey Downs Primary School Little Athletics Club in October 1972 by Otto Arens (Life Member). Shortly after a meeting was organised at the Banksia Park Primary School where a Centre Committee was inaugurated with an embryonic Ridgehaven Club, namely a Mr Suckling and son. At that stage the SALAA insisted that "any centre must be based on at least 3 clubs". At that first meeting fees were set at $0.80. Equipment at that stage consisted of one Shot Put, one Discus, a home made High Jump stand and bar, and a starting pistol. Registrations for the first Season 1972/1973 started with 24 and ended with 113. This second season saw the Modbury Club get off to a flying start with a very active committee. The TTG Council accepted in principle our plans for a HQ, with 2 unnamed sites in mind and the caution "that it was to be a long term project". The uniform changed to blue tank tops and white shorts. 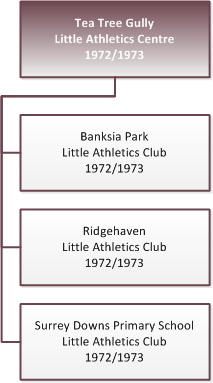 This third season saw the formation of the Dernancourt and Highbury clubs. Competition was mainly held at the Modbury Primary School where the track wound its way between the football goal posts. But at least all the equipment didn't have to be carted around, only the hurdles in lots of 5 which went to the various clubs. The TTG Council promised the new oval adjacent to Petaringa Oval for our temporary HQ until the sub-division in Australia Avenue was finished which would then become our permanent base. The Highbury Club ceased to operate. "In 1975 on a Little Athletics car rally which finished up at a winery, two men while tasting the wines and waiting for the BBQ to cook (it was a bit on the wet side that day) came to the conclusion that it was sad and also a waste of talent that after the U/13's there was nothing for athletes in this area (the nearest club being Enfield). A few drinks later one of them agreed to become president providing enough support was shown, so wheels were set in motion." 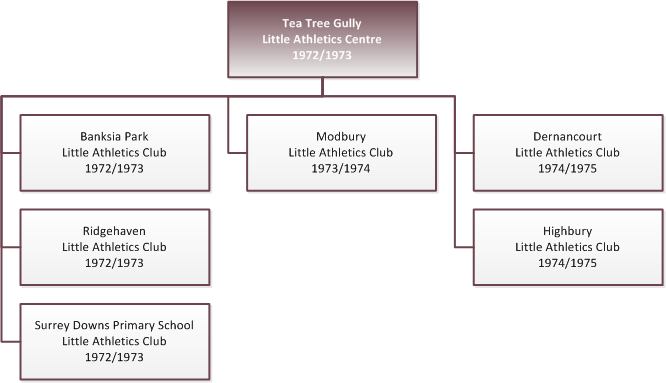 The Senior Athletics Club was established at a public meeting held in the Supper Room at the Tea Tree Gully Civic Centre, Modbury on Thursday 29th August 1975 at 8pm. The club founders saw the club as being part of a community complex that would offer the local area sporting and recreational facilities. The president at the time was Peter Hughes. "That first season we had eighteen registered athletes, a very small beginning." The inaugural meeting of the TTG Athletics Centre Incorporated (Association Number A6123, 19 October 1978) took place. A Centre Management Committee was to manage both bodies from the one committee. It was to prove a difficult and trying year and because of the extreme difficulties the following year was to have a different set-up. The uniform was to change yet again for the Little Athletics but this time the Little Athletics and Seniors would be in the same colours: Claret and Blue. Finally the TTG Council were pinned down to finding us a permanent HQ and we were offered the new development area at Smart Road, St. Agnes to be finished in 1982. A Development Manager, Wendy Barber, was elected to keep the pressure on the Council. Budgets were introduced into the management of the centre for the first time. The Tea Tree Gully School Club was formed by Ron Mitchell, School Principal. On Friday 2 March 1984 the foundations of the new clubroom were poured. The Long Jump facilities were upgraded in 1994. Work started some time after 22 June 1994. This was made possible by a significant contribution from the Tea Tree Gully Council, a grant of $9000 from the Department of Recreation, Sport and Racing as well as the work and financial input from the centre. The surface of the run-ups was laid during a working bee on 15 October 1994 by TTGAC volunteers. 2 March 1984 (TBC) Foundations for new Clubroom poured. 28 October 1984 Official opening of our new clubrooms by the Premier of South Australia, Mr. John Bannon. DD July 1984 (TBC) Bingo at TTG Hotel ends after 10 years. Sunday 27 November 1994 Official opening of the upgraded Long Jump facilities. August 2015 Completion of Clubroom major kitchen renovation. Since 1975 the TTGAC has been trying to obtain a home and clubrooms. Various avenues have been discussed with the TTG Council but for various reasons all proved unsuccessful. Bulkana Oval was considered about that time, but TTG Council indicated that they would not give us permission to build there and also there did not appear to be enough land for the Senior athletes to practise throwing events without endangering the safety of the younger athletes. It was not until May 1970, that it really looked likely that our desire for a home would be realised, when we learnt that the TTG Council were going to male land in the St. Agnes area available for recreation. The TTGAC Development Committee was an ad-hoc committee formed in June 1979, for the purpose of planning a permanent H.Q., for TTGAC with permission to consult with any Local, State or Federal Government Departments to achieve that aim. Negotiations between ourselves and the TTG Council then commenced with the aim to secure land on the St. Agnes site for an athletics complex. After many months of proposals and counter-proposals, TTG Council stated on 22 April 1980, that they would "Endeavour to complete the track and field facilities within 3 years, and for TTG Athletics to arrange for the building of an amenities building within 3 years." The site for the intended development was to be on land adjacent to the Smart Road Waste Disposal Area. Once again negotiations between ourselves and TTG Council went on for many months, other local groups were invited to participate in the venture, and St. Agnes Recreation Area Advisory Committee was formed and all groups submitted what their requirements would be in the proposed complex. It was finally decided that TTG Soccer Club and ourselves would combine resources to build clubrooms. TTG Council stated that they would be willing to prepare plans and provide toilet/change rooms, storage and kiosk and to bear associated costs. Everything seemed to be going well until November 1981 , when we were informed by TTG Council that the proposed site at St. Agnes was directly over an old clay mining area and that there would be a real danger of ground subsidence in the future. If we wished to build on the site we were advised that the building would need to be supported on concrete pillars sunk to a depth of 30 metre, and the track area would need to settle for a minimum of 7 years before it would be suitable as a sporting surface. TTG Soccer Club and ourselves mutually agreed we should abandon the St. Agnes Project and search for alternative sites. After further discussions with Council they agreed in January 1982, to the construction of an amenities building for TTG Athletics at Bulkana Oval, on the proviso that Council would not be financially involved. They also agreed to endeavour to provide us with a suitable throwing area. To finance an amenities building it was obvious we need financial assistance, so an application was made for a grant from the Department of Recreation and Sport, under the Capital Assistance Program for 1982. Although we drew up draft plans of the facilities we needed, we were unable to draw detailed plans until we heard officially that we had been unsuccessful with our application. After further enquiries we found that other groups in the area had been granted financial assistance with projects that we considered had possibly less merit than ours, we also discovered that these other groups had taken a different approach when submitting their applications, We had submitted our application exactly as stated by the Department of Recreation and Sport, but the successful applicants had made submissions via an alternative route. We gained access to the alternative route but then found that we were faced with another problem. We wished to apply for a grant under 1983's allocation of assistance, we also wanted to start building as soon as possible, bearing in mind that we might again be unsuccessful candidates for next year's allocation, we did not wish to waste another year, but the Department of Recreation and Sport do not normally give grants to projects that have already been started so by starting to build we were liable to jeopardise and future application for funds. Representations were made to the Minister of Recreation and Sport explaining our predicament and on 26 October 1982, the Minister advised us that we could commence construction of Stage 1 of the building programme without jeopardising a future application under the Capital Assistance Programme. The TTGAC component of the building cost was $73,000 plus $4632 for air-conditioning. Official opening of our new clubrooms by the Premier of South Australia, Mr. John Bannon on 28 October 1984. A request to the TTG Council for the installation of lights was considered for inclusion in the 1996/1997 FY budget. The winter season of 1997 saw the oval used for the first time by another sporting body (soccer). In the future, junior football games will be played on the oval. This liaison with the football club was seen as a positive move since a joint application for lights would be viewed more favourably by the council. Lights were eventually installed in YYYY. In 1993 the gymnasium was named in honour of Eric Matthews, a long-standing and dedicated servant of the TTGAC who passed away after a battle with cancer. Kitchen renovation - Government Grant and sponsors. The first accepted uniform was all white, mainly because so many of our members also attended the TTG Youth Club which had a similar uniform. However at the State Relay Championships we competed in purple T-shirts. For Season 1973/1974 the uniform was changed to a blue tank top and white shorts. In Season 1978/1979 the TTGLAC uniform was changed to be the same as the Seniors, namely a claret and blue tank top with white shorts. For Season 1981/1982 the colour of the female's shorts were changed to maroon. For Season 1982/1983 the uniform was a maroon singlet/blouse with blue vertical stripe down the centre, white shorts with a blue stripe (men) and maroon shorts (women). In June 1995 SALA granted permission for the club logo to be added to the back of the athletes uniform top for the start of Season 1995/1996. For Season 1996/1997 it became compulsory for the LAs uniform to have sleeves. Season 2010/2011 saw a complete refresh of the Little Athletics uniform. For Season 2015/2016 older LAs were permitted to wear the club singlet. This season also saw the introduction of an on-line Uniform Shop via our web-site and the sale of associated centre merchandise. Represented Australia at the Athens Olympic Games 2004, winning SILVER in the 4 x 400m relay. Represented Australia at the Melbourne Commonwealth Games, winning GOLD in the 4 x 400m relay. Represented Australia in the World Championships in Paris in 2003 in the 4 x 400m relay. During 1996 the TTGAC worked with the S.A. Athletics League (SAAL) to organise a Professional Athletics meet on Sunday 19 January 1997. In that first year the most time consuming activity was the organisation of sponsorship for the various events. The SAAL required the TTGAC to raise a minimum of $1500 which we were able to achieve. Support was provided by the TTG Council including mayor Lesley Purdon. The vision of the TTGAC committee was for an event which becomes established, the grows and benefits our centre by giving us an opportunity to fund-raise and by increasing our community profile. If we can keep our sponsorship for future years and hopefully increase it, then the pattern established for this meeting can be repeated. As people involved in athletics we should all be keen to be part of an event which someone else organises and runs. Our involvement with the pro meets will obviously depend on their success and the TTGACs willingness to maintain support. The main event was the 'Gully Gift'. In 1997 this was the Open Men 200m sponsored by CSR ReadyMix and came with a first prize of $550. The Open Women 200m sponsored by Boral Hollostone came with a first prize of $300. The last Gully Gift Professional Meet was held in January 2017. The TTGAC support for the event ceased because the original objectives for supporting it were not being achieved. Considerable effort was required each year to generate enough sponsorship for prize money - the fact is this amount often far exceeded the funds raised during the event and often exceeded the amount of sponsorship of the TTGAC itself during the year. It became harder to organise with dwindling volunteers. At various stages during its history, including the first year, the possibility of combining the event with another carnival was considered but didn't eventuate. Wendy Barber, 1982, "History of TTG Athletics Centre"
This page is a work in progress. If you are able to provide any historical information please contact us.